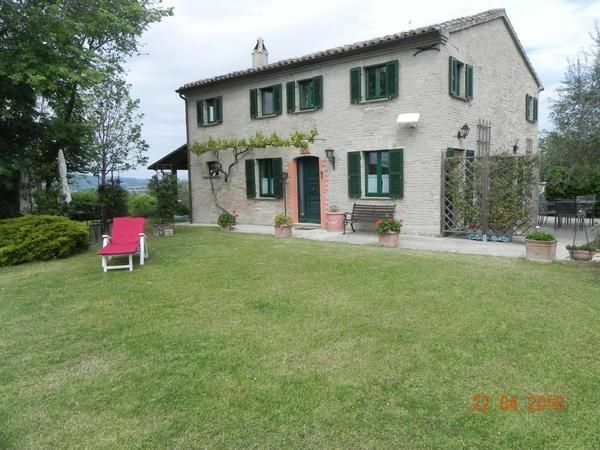 The former farmhouse "Casa il Poggio" was built in 1900 and lovingly restored after purchase, to maintain the original character of the house. It is divided into two independent units. The front part of the house is rented, while the other is inhabited by the owners. The apartment has approximately 60 sqm on two levels sleeps 2 adults and 2 children. Access is via a large terrace South-East in a well-equipped kitchen. A spacious shower room with toilet is also located on the ground floor. A spiral staircase leads to the cozy living room with a double bed (200x160). Next door is the bedroom with double bed (200x160). Casa il Poggio is located in the hills between the Apennines and the sea on a 2,000 m², well-kept (fenced) grounds. Our guests have a pool (5m diameter), 2 furnished terraces with umbrellas and garden chairs and a charcoal grill available. Sandy and pebbly beaches can be reached by car in about 15 minutes. Numerous restaurants spoil their guests with specialties from the Marche, such as home-made pasta and fresh fish. Before booking with dog, please contact landlord !!! - Final cleaning: once per object costs in the amount of 50 EUR (compulsory). - Heating: per object and day according to consumption (obligatory). - Bed linen: Bring by the tenant per person per week (compulsory).